At KUL, departing and arriving passengers are mixed together, and there’s security at each gate. For this flight, there was only metal detector going for an entire A330, so we were actually delayed because people were still trying to get through security instead of boarding. The flight was originally scheduled to be a 737, but there was an aircraft swap, which meant fully flat seats on this relatively short flight to DPS. I sat in 1A this time, which is a single seat closer to the aisle. The foot cutout in the bulkhead is enormous compared to the throne seats, so even though the seat feels a little exposed to the aisle and doesn’t have as much counter space, I think I would prefer 1A to any of the throne seats in the future. A pre-departure beverage of juice or water was offered, and they distributed cold towels and newspapers. The IFE selection was the same as on my longer flight from PEK, but the headphones were much worse quality on this flight. The flight was pretty turbulent after takeoff. I was actually a little worried about the flight attendants because they were trying to serve people drinks at the time, and my drink at my seat spilled a bunch. But eventually, the turbulence stopped and they were able to do a meal service. For this flight, the Asian vegetarian meal was a lentil curry with carbs in two forms. It was definitely better than the Asian vegetarian meal I had on the previous sector. Overall, it was a nice little treat to get to fly on an A330-300 on this flight to Bali instead of a Boeing 737-800, and the food was better on this flight than on the flight from PEK to KUL. This entry was posted in Malaysia, Travel, Trip Reports and tagged a330, avml, business class, flight review, malaysia airlines, travel, trip report on February 18, 2018 by Edward. I’ve flown Malaysia Airlines business class in the past, but this was a renovated business class cabin, so it was a huge improvement over the past hard product that I’ve flown. Instead of angled-flat seats, these are forward-facing fully-flat seats in an alternating 1-2-1 and 1-2-2 configuration. For this flight, I was seated in 6K, which is one of the throne seats on the side. The cabin skips row 3 for some reason, but the throne seats are 1K, 4K, and 6K, while 2A, 5A, and 7A are the single seats that are closer to the window. The throne seats have tons of counter space on both sides. There’s are also storage spaces on both sides of the seat. The seat itself is comfortable, but the foot cubby is super small. I probably would select a non-throne seat in the future. One slight novelty is that the seatbelts had shoulder straps. There were also air vents on this plane. There was a pillow, blanket, and headphones already at the seat. The headphones were not noise cancelling. IFE was started on the ground, and the selection was pretty decent, but there were ads played before every movie. Before departure, a flight attendant came around offering juice or water, and then hot towels and newspapers were distributed. After takeoff, packets of unsalted mixed nuts were distributed, and then they came around with a satay cart. I had pre-ordered an Asian Vegetarian meal, and the AVML satay was just vegetable skewers (one uncooked, one grilled). There was no satay sauce to accompany these skewers. The satay service was the only after takeoff meal. Once they were done distributing the satay, that was it. On this flight, there weren’t any amenity kits, no pajamas, and there were no menus. They also gave no indication that the satay service was the only meal service after takeoff. They also didn’t turn off the cabin lights even though everyone was sleeping. It was a bit strange. I’m not a large person, but I did feel like the seat was pretty narrow. Just lying down on my back, my arms touched the sides of the seat. I think the throne seats may feel slightly narrower because they are enclosed on both sides. I was woken up for breakfast two hours prior to landing, even though I wasn’t asked if I wanted to be woken up. For the pre-arrival AVML, I had a fruit plate and pastry to start (the thing in the corner is some sort of jello dessert). The fruit plate was pretty good. The entree for the Asian Vegetarian meal was some sort of croquette with marinara sauce and paneer and pepper skewers. This was fine. Overall, the hard product on this flight was vastly improved from MH’s previous business class on the A330, but the soft product left a lot to be desired. Like I don’t understand why there weren’t menus, I wish flight attendants had asked if you wanted to be woken up for breakfast, I wish the flight attendants made it easier to sleep (e.g., by turning off the cabin lights), etc. This entry was posted in Malaysia, Travel, Trip Reports and tagged a330, avml, business class, flight review, malaysia airlines, travel, trip report on February 17, 2018 by Edward. To board this flight, you first had to scan your boarding pass to be let into the holding area. After that, it was essentially a free-for-all, even though they made boarding announcements to let families with small children, business class, and oneworld elites to board first. In the US, I can understand why people jockey for boarding position given the fight for overhead bin space, but I generally haven’t seen the same fights happen in other countries until this flight. Even though passengers are supposed to be limited to 7 kgs of carry-on baggage, there was definitely a scramble for overhead bin space on this short flight. And in comparison to my nearly-empty Malaysia Airlines flight from DPS to KUL, this flight was nearly full. The interior of this plane looked really new. Lots of dark leather. The seats in economy class and individual IFE screens (controllable via touch screen and remote), in-seat power outlets, and a USB port. The IFE selection was on-demand and pretty sizable for a domestic route, and there were personal air vents. Overall, this was a super nice plane for a domestic flight. I managed to snag an exit row seat for this flight, which meant that I had lots of leg room. The seat did not appear to recline, though. Since this was such a short flight (~201 miles), there was no meal service, but they did do a full drink service with peanuts. Rather than use a cart, they did the entire service via trays. Yet again, this was a positive experience on Malaysia Airlines. This plane was great: new interior, personal IFE, air nozzles, and in-seat power. Can’t ask for much more on a domestic flight! This entry was posted in Malaysia, Travel, Trip Reports and tagged b737, economy class, flight review, malaysia airlines, travel, trip report on November 20, 2015 by Edward. Malaysia Airlines has a great domestic terminal lounge near gate A2. It’s pretty great as far as domestic lounges go. The lounge has lots of seating, and there are lots of windows, so plenty of natural light. They also have a phone charging station, which can be useful. The food selection is pretty extensive for a domestic lounge. There’s a noodle bar, a couple of hot food options, some salads, desserts, and fruit. The noodle bar had kway teow noodles and mee rebus that day. I got some mee rebus with just tofu and vegetables instead of chicken and fish cake, and it was better than the wanton noodles I had eaten in the first class lounge. The mee rebus just had lots of flavor, lots of complexity, and just tasted more distinctly of Malaysia. I also overindulged in desserts in this lounge. I’m a sucker for Asian desserts, and the green dessert thing was delicious (I think it was congealed sticky rice with pandan flavored stuff on top). The papaya was also pretty tasty–for some reason, I find papaya in the US to taste rotten, but I really enjoy eating it in Asia. This lounge also has a pay spa and showers in the lounge. The showers are pretty small, and you need to request amenities and towels. Overall, I was very impressed by this lounge. It would qualify as a pretty decent international business class lounge, but the fact that it serves domestic passengers means it’s pretty awesome in comparison to its peers. It’s perhaps similar to Qantas domestic lounges. My only small issues were the lack of electrical outlets and that I had a hard time connecting to the wifi on my phone, but it’s a nice lounge with good food options. This entry was posted in Lounge Reviews, Malaysia, Travel, Trip Reports and tagged airport lounge, kul, lounge review, malaysia airlines, travel, trip report on November 20, 2015 by Edward. I’ve reviewed the Malaysia Airlines First Class Lounge at KUL before, but this review includes pictures of the shower and the daytime food selection, which my last review did not (given that I mostly used the lounge very early in the morning that time). First up, the shower rooms. The lounge has a couple of shower rooms in the bathroom. They also have sleeping rooms. The first class lounge has a proper dining room with table service. This can be a little too much given that I’ve never seen more than a handful of other passengers in the lounge at one time, so it can be a little strange when there are 3 people serving just you in a dining room. They have both a buffet and a made-to-order menu. The food options on the business class side of the lounge are actually more extensive than the options they have on the first class side of the lounge, but you can always ask them to get food from the business class side for you (or you can go yourself). I do wish that they would add more Asian options to their menu, as well as more vegetarian options. I think the focus on Western food might just be based on a perception of what’s “fancy” in Malaysia, as I thought it was somewhat strange that there was blueberry cheesecake on the menu (like do they even eat cream cheese or blueberries in Malaysia on any regular basis?). That being said, the blueberry cheesecake was pretty tasty. I was not a big fan of the smoked salmon appetizer. The wanton noodle soup was pretty good. 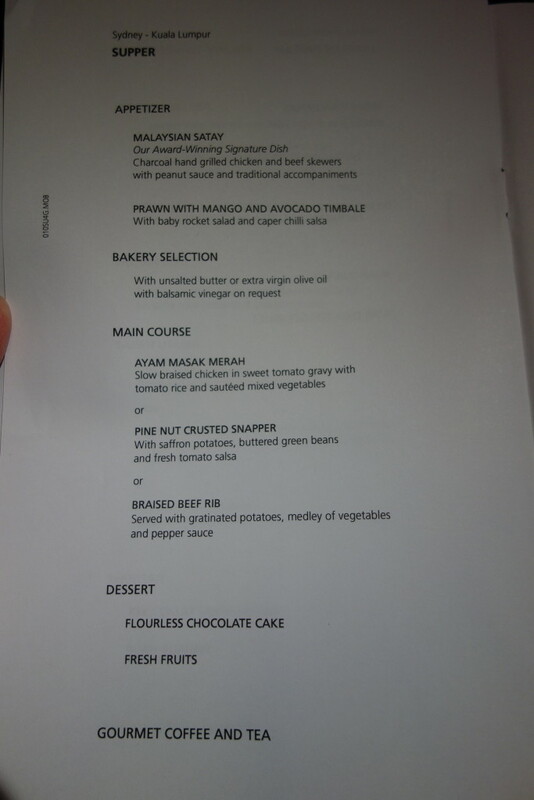 As stated above, the business class side has a lot of food options as well. In addition to a noodle bar (which had mee hoon with tom yam and wanton noodle soup that day), they have a lot of hot food options. There were more soups, chicken korma, prawns with Phoenix sauce, roasted potato wedges, sautéed vegetables, cod filets, plus bakery and cold items. There’s also a pay spa located in the business class side of the lounge. This lounge is located in the Satellite terminal, which is where the international flights arrive and depart from. Given that arrival and departure passengers are mixed at KUL, you can use this lounge both as an arrival and departure lounge, as well as a transit lounge when you’re connecting from international to domestic flights. This entry was posted in Lounge Reviews, Malaysia, Travel, Trip Reports and tagged airport lounge, kul, malaysia airlines, travel, trip report on November 19, 2015 by Edward. On this trip, I needed to fly from DPS to PEN. I had a number of different options, but I ended up choosing to fly Malaysia Airlines through KUL. I’d flown MH before in business class, but this was my first time flying them in economy class. Boarding started only 20 minutes before the scheduled departure time, but that may have been because it was such a light load. For some reason, I was assigned a seat essentially at the very back of the plane, but I didn’t complain because I essentially had a couple of rows to myself at the back of the plane. There are two large economy class sections, and I enjoyed the bright colors of the seats. The seats are generally in a 2-5-2 seating configuration, and the seats are fined for a <3 hour flight. There are personal IFE screens at each seat, and there are individual air nozzles! The side seats in row 29 have unlimited leg room because of the emergency exits. At row 39, it switches to a 2-4-2 seating configuration, but the center seats in that row have immovable armrests. The IFE screen quality wasn’t great, but at least there was personal IFE. It took me a long time to figure out that in addition to looped movies, there was also some on-demand content. Even though the flight had a super light load (there were maybe 20 seats taken in the section of economy that I saw), there were tons of people who had ordered special meals (myself included), and the flight attendant brought out multiple trays of special meals. I ordered an AVML for this flight, and it had lentils, rice, and paneer. The lentils were quite delicious (the paneer not so much), and I would definitely order this special meal again. The lentils were really good for airplane food. The flight attendant serving me drinks did address me by name several times, and I wasn’t sure if this was due to my oneworld status or just because there were so few passengers. Overall, I’m a big fan of Malaysia Airlines, and I’m still sad that they’ve had so many bad things happen to them. There’s no reason to avoid flying this airline, and I’ve only had positive experiences with them. This entry was posted in Malaysia, Travel, Trip Reports and tagged avml, economy class, flight review, malaysia airlines, travel, trip report on November 19, 2015 by Edward. Given that my flight arrived from Sydney so early in the morning, I thought I’d try to hang around the airport for a little bit before heading into the city and trying to check in early to my hotel. Thankfully, at the Kuala Lumpur airport, both arrivals and departures are mixed, so it is feasible to head to an airport lounge after arriving on a flight, even if you don’t have an onward ticket (this is not the case in most airports since arriving passengers are directed toward immigration or transit, and you can’t get through transit security without an onward boarding pass). I had no trouble using the lounge on arrival, even though it’s not strictly supposed to be used as an arrivals lounge. It’s perhaps worth nothing that the first class side of the lounge doesn’t open until 6am, so I started on the business class side of the lounge. The business class lounge is quite large with tons and tons of seating. For food, they have a bakery area, a made-to-order noodle bar, and a number of hot food dishes. The food wasn’t completely set up so early in the morning, but there’s still enough to eat a meaningful snack if you’re hungry. There are also a number of different “rooms” in the lounge as well. Beyond the children’s play room, there’s a relaxation room, a game room, and a place to get massages (which you have to pay for). The wifi in the lounge was decently fast as well, although there weren’t many people using it so early in the morning. Around 6am, I made my way to the first class side of the lounge to check it out. It’s not nearly as big, but it needn’t be, as there weren’t many people using it (and I’ve never seen more than 3 other people using the lounge any time I’ve passed through). The seating in the first class lounge is nicer than the seating on the business class side. There are also people who will go around and check on you and offer drinks. There’s a smoking room, showers, sleeping rooms, and a formal dining area. For food options, they generally encourage you to use the formal dining area, but they also have a small self-service food and drink bar (although the turnover on the food is probably very slow, so I think you’re safer getting food in the dining room). In the formal dining room, they have a small buffet as well as a made-to-order menu. The dining room is nice, with decent views of the apron. The made-to-order food is fine, although I wish they had more vegetarian options on their lunch/dinner menu. Overall, I really like this lounge. It’s never been crowded when I’ve visited, teh tarik is pretty delicious, sleeping rooms are an amenity that I think more lounge should have, and service is well-meaning and attentive. This lounge isn’t flashy, and the first class side doesn’t have the same amenities as other first class lounges do, but I’ve enjoyed every visit I’ve had to this lounge. This entry was posted in Lounge Reviews, Malaysia, Travel, Trip Reports and tagged airport lounge, kuala lumpur, malaysia airlines, review, travel, trip report on July 6, 2015 by Edward. To get from Sydney to Kuala Lumpur, I chose to fly Malaysia Airlines. This was my first time flying Malaysia Airlines, and I’m saddened that they’ve had so many unfortunate incidents and are going through hard times as I think they’re a solid carrier that I would happily fly again (and have since this first flight). This aircraft featured a typical regional business class seat and configuration for Asia, so it was 2-2-2 seating with angled-flat seats. The cabin looked pretty new, and the seats didn’t feel worn or tired. When I arrived at my seat, I thought there were two blankets and a pillow, but one of the “blankets” was actually supposed to be used as a seat cover. No actual mattress for the seat, but it’s something. I was offered a pre-departure beverage of juice or water. Rather than just orange juice, they also had apple juice and mango juice on offer. As boarding finished, one thing that I noticed was that almost half of the business class passengers were female. It’s pretty rare to have near gender parity in a business class cabin (e.g. I’m currently writing this on an AA flight in first class where there are 3 women out of 16 passengers). In total, the cabin was 28 out of 36 full. Amenity kits and headphones were handed out after takeoff. They didn’t offer slippers proactively, but you could request them, although they were pretty flimsy. Catering on this flight was a supper service and refreshments before landing. I pre-ordered a VGML. First up was the satay. Malaysia Airlines is supposed to be famous for their satay, so I had to try it. The satay sauce was pretty delicious, but the beef was not as it was tough and dry. The chicken was a bit better. The VGML came with vegetarian skewers, but to be honest, I’ve never had vegetable skewers that were delicious. They’re usually edible, but also underwhelming. The tofu from the vegetarian skewers dipped in the satay sauce was delicious, though. After satay came an appetizer of cold vegetables. I wish airlines would stop serving cold vegetables as part of vegetarian special meals. There are so many other cold vegetarian dishes that could be served like hummus or other bean dip or salad or spring rolls or anything else really. The fruit was tasty, though. My main course was some sort of mushy rice (?) cake served in a tomato-y sauce. It wasn’t the worst VGML I’ve eaten (I still think Thai First Class holds that dubious honor), but it wasn’t great. Bland and mushy aren’t a great combo. For dessert, I had some of the chocolate cake, which was pretty good. Two annoying things about the in-flight entertainment: 1) the screen was awkwardly low and couldn’t be adjusted, so it wasn’t very easy to watch unless your seat was at least partially reclined; and 2) they played 3 minutes of ads before each movie. After dinner, I put the seat into the sleeping position. The seat was firm and slanty. I slept fine for 5 hours, but it wasn’t very comfortable for side sleeping, and my back was not happy when I woke up (does this mean I’m getting old?). The blanket was nice, but I wish the seat cover had more padding and the pillow were bigger. They prepared the cabin pretty early for arrival. There were some movies about Malaysia and the arrivals process. My favorite part was the “celebrating 1Malaysia” song with lyrics like, “Truly Asia, the best place to be”. So catchy. This flight is somewhat awkwardly timed in that it gets into KUL at 4:30am. To me, it would make so much more sense if they pushed back departure two hours so that it departs at 11:40pm and arrives at 6:30am, but i believe there are airport curfew restrictions at SYD that prevent a later takeoff. But it’s over 8 hours of flying time, so you theoretically could get a decent amount of sleep. Overall, it was a good flight on MH. The cabin manager was great and addressed me by name at all interactions. And he used a more accurate version of my last name rather than how it’s typically pronounced in English. Yes, the seats could be better, but I see no reason to avoid flying Malaysia Airlines. This entry was posted in Malaysia, Travel, Trip Reports and tagged a330, business class, malaysia airlines, mh, travel, trip report on May 31, 2015 by Edward. Earlier in 2014, there was a brief period when Qantas released a bit of first class award space to Australia. Qantas first class is a pretty challenging redemption, so I jumped on the opportunity, even though it meant that I would be heading to Australia during its winter. I redeemed 72,500 American miles for a first class award to the South Pacific. I thus had a ticket there, but no specific thoughts on how to get back. There wasn’t any award space in first class on Qantas, which meant that if I wanted to use my AA miles, I’d have to route through Asia. AA’s award routing rules don’t let you route through Asia to get to/from the South Pacific without paying for two awards, so I decided to stop in Kuala Lumpur on the way back for a couple of days. This means that I paid for a business class award from Australia to KL and paid for a separate award from KL back to the US, which I would have had to do anyway even if I hadn’t stopped at KL. I booked a business class award on Malaysia Airlines for 35k AA miles for the nonstop from Sydney to Kuala Lumpur, and then I spent 67.5k AA miles for a first class award on Cathay Pacific through Hong Kong to get back to San Francisco. Then, I considered lodging for my trip. I would be spending 4 nights in Sydney, so I booked two reservations for the Radisson Blu Plaza Hotel in Sydney, one from my personal Club Carlson account and the other from my business Club Carlson account. Since I have both the personal and the business versions of the Club Carlson credit card, each reservation received one free night, so I essentially paid for two award nights and got four in return. This was 100k Club Carlson points for 4 nights at a great hotel in a great location in Sydney. In Kuala Lumpur, I booked 2 nights at the Hilton Doubletree for 10k points per night or 20k points total. So in total, I spent 175k American miles, 100k Club Carlson points, and 20k Hilton points for a pretty darn luxurious week-long trip to Sydney and KL. This entry was posted in Awards, Cathay Pacific, Club Carlson, Hilton, Malaysia, Qantas, Travel, Trip Reports and tagged planning, sydney 2014, travel, trip report on February 9, 2015 by Edward.